Enter your phone number and play on the go! Get ready brave adventurer, for an expedition like no other! 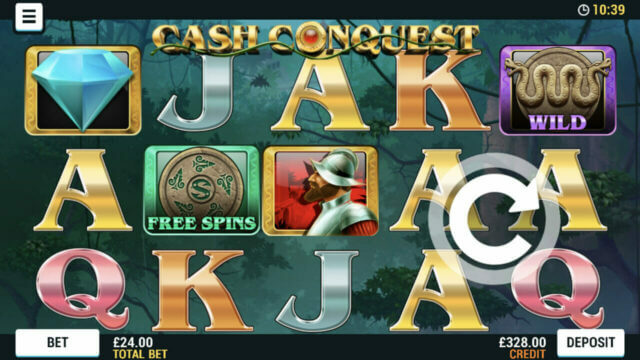 Join Mr Spin in Cash Conquest mobile slots and journey deep into the jungle. Will you find long-lost treasure as you traverse the unknown? There’s only one way to find out! In Cash Conquest, your journey will take you to a mythical land where it’s said there are treasures unknown. Can you stake your claim and take this mobile slots landscape as your own? Or will you get lost in its depths forever? Ready explorer? To start making history with Cash Conquest, you’ll need a device running iOS 10 or Android 5 and above. Once you’ve packed your kit, all that’s left to do is head deep into the jungle! The first thing you’ll want to do is set your bet-per-line – Cash Conquest is fixed to 20 win lines so you don’t need to worry about adjusting this value. Tap ‘Bet’ and use the ‘+’ and ‘-‘ buttons to adjust your bet-per-line. You can bet anything from 1p to £10 a line, and your ‘Total Bet’ will adjust automatically. This is your bet-per-line multiplied by the number of active win lines – always 20 in the case of Cash Conquest. For instance, if you bet 10p a line across all 20 win lines your total bet will be £2. Tap the arrow when you’re ready to play! You might need both hands free to cut back the undergrowth, but never fear! You can keep spinning with the ‘Auto Spins’ feature. Tap ‘Bet’ and choose ‘Auto Spin’ to set this up, and the Cash Conquest reels will spin in on their own while you explore the jungle. All you’ll need to do is choose a number of spins, credit limit, and maximum win amount and tap the arrow to start the Auto Spins. These will come to an end when you run out of spins, hit one of these limits, or you tap ‘Stop’. You’ve not got a map to guide your way – this is unchartered territory after all – so how do you know if you’ve spun in a win on Cash Conquest mobile slots? That’s Inca-redibly easy! The win lines pay from left to right, and any winning lines (and your prize amount) will be lit up on screen. And how do you bag a win? You need to spin in a winning combination of symbols on an active win line. You need at least 2 of the Cash Conquest Big Win symbols – the diamond, explorer, and Jackpot symbols – and 3 or more of the same letter symbol to bag a win. Wins are awarded as a multiplier of your original bet-per-line, and the detail of these can be found in the paytable. You’ll feel like you’ve really conquered this mobile slots game when you realise you can win across more than one active win line with a single spin. These wins will be added together before topping up your balance. Be careful though; the ancient Gods who rule over this land have decreed that only the highest single win per line will be paid. Normally, if a snake slithers across your path it’s not a good sign. However, if you spy the Cash Conquest stone snake symbol on your reels, your luck could be in! That’s because this is your Wild symbol, and Wilds can substitute for nearly all other slots symbols and can turn losing spins into winning ones. Here’s how they work! Say you spin in two of our explorer symbols alongside a Wild. The Wild will serve as an explorer symbol and you’ll receive the multiplier for x3 explorers! Wilds can’t do everything though. They won’t substitute for the Mini-Game or Free Spins symbols, nor can you win the progressive Mega Jackpot where a Wild replaces a Jackpot symbol. You need five golden God symbols to make off with the top prize! If you want to find some real ancient treasure, you’ll want to play the Wheel of Wonder mini-game! To activate this, you need to spin in two or more of the golden wheel mini-game symbols on an active win line. The more symbols you spin in, the higher the prizes up for grabs in the Wheel of Wonder mini-game! On entering the mini-game, you’ll find yourself in front of the Wheel of Wonder. Around the wheel, you’ll find a number of white and blue multipliers, and one huge red prize. Tap to spin the wheel and see where it lands. If you land on a white multiplier, you’ll win that amount and return to the main reels. Land on a blue arrow, and you’ll win all of the blue multipliers added together before heading back to the main reels. But if you land on the red arrow, you’ll win the huge prize hidden in the centre before heading back to the main game. The Free Spins shield symbol will do more than protect you as you traverse through the unknown. It will also protect your cash from taking a hit as it could help you win up to 15 free spins! Spin in 3, 4, or 5 of them anywhere on the reels and you’ll receive 5, 10, or 15 respective free spins! You won’t be able to change your bet-per-line whilst in Free Spins mode, but that doesn’t matter! As Mr Spin is paying for these, your credit won’t take a hit. Ready for an adventure? Play Cash Conquest today and see if you can emerge from the thick of the jungle with some ancient treasure! What’s more, if you’re new to Mr Spin and sign up today, you’ll grab up to 50 FREE SPINS* to try out our original games! When you make your first deposit, we’ll also match that 100%, up to £100. * Sign up today, and take on the Cash Conquest. *18+. New players only. Up to 50 locked free spins available to win via the New Player Bonus, usable on Reel Royalty only. All winnings paid as bonus credit with a x20 wagering requirement. This Bonus expires 14 days after player registration. Max withdrawal without depositing is £50. 100% deposit match of first deposit, up to £100 awarded as bonus credit. Deposits have a x1 wagering requirement. You can withdraw the funds in your cashable credit account. T&Cs apply, BeGambleAware.org. During any spin there is a chance that the Progressive Mega Jackpot can be triggered by achieving 5 (FIVE) Jackpot symbols on an active win line. The Progressive Mega Jackpot is available on any bet, with 0.025% being split evenly between the Progressive Mega Jackpot and the Reserve Jackpot. The Mega Jackpot seed value is £100,000. The Mega Jackpot Promotional Pot System is available on any stake on any participating game plugged into the Mega Jackpot Promotional Pot. When the Jackpot is won in any of the participating games, it is reset to the seed value and begins to rise again. Simultaneous wins can occur, if another player wins the progressive Jackpot then a notification to this effect would occur BEFORE the current player was awarded the Jackpot. The likelihood of winning the Mega Jackpot increases in correlation with the players bet amount. In the event of a communication error after a Mega Jackpot win result has been determined and before it has been displayed on screen, the win amount will automatically be transferred to the player’s account. While the game is live, the Jackpots cannot be terminated. Cash Conquest has a theoretical return to player of 94.7%. This is based on long term playback. System malfunctions void all payments. Monies are staked in the following order: winnings, player deposits, bonus credit. Mr Spin general terms and conditions apply.